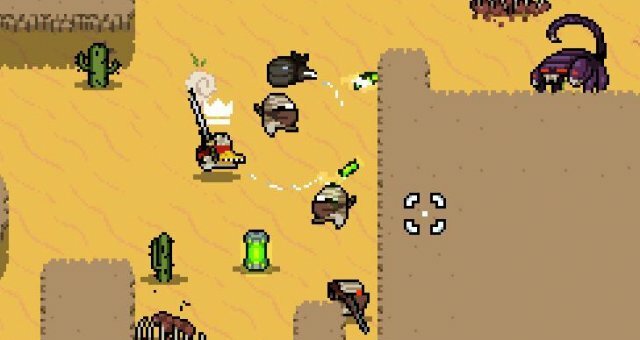 How well you do in Nuclear Throne is measured not through how far you get, but through how many kills you get. This is especially true on dailies and weeklies, so here is a guide on how to get the most kills and get the best score possible. This guide contains all the spoilers! This guide will include spoilers for the entirety of the game. I first want to speak about difficulty. Every time you enter a portal, the difficulty goes up by one. This makes more enemies spawn in each level, but also makes better weapons appear sooner. This is why secret areas are vital, as though there are few of them getting through them sooner will help beef up your kill count, and get you the most impressive score! The guide is split up into all the different areas, with lengthy tips to make sure you're doing it the most efficiently as possible. At the very least, I urge you to read the Police HQ category, as it is really what matters the most when it comes to kills! Pizza sewers is reached through blowing up the manhole on 2-1(If loop, you must kill mom before you can blow it open.) It is one of the easiest places in the game to reach, and is a nice difficulty boost and some small padding to your kill count. Any explosive weapon works, besides jackhammer, blood weapons, melting blowing up corpses, and fire weapons. If the floor is fully tiled, there is a chance the manhole may not appear. The manhole can spawn underneath chests, and it's barely bigger then them, so look carefully if you cannot see it at first. Rogue's portal strike and blast armor can both blow up the manhole. 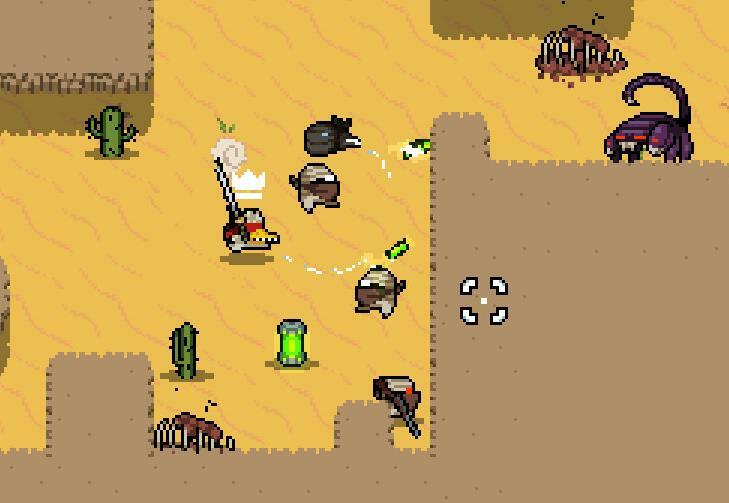 Chicken and Eyes can carry other weapons through portals, so if you find an explosive weapon in the desert, bring it along with you! If you don't have an explosive weapon on loop, you can try to bait the idpd to throw a grenade at you, and use a melee weapon to knock the grenade within range of the manhole. If you kill every enemy quick enough while in pizza sewers, the portal can spawn before the cops drop out of the idpd van, saving you from a possible deadly elite confrontation, but you will miss out on those few extra kills. Vaults are a temporary way of increasing difficulty. You must break the center open, kill enemies around it to fill it with rads, then break it. Entering it will get you crowns, and a nice difficulty increase, and some cool crowns. You may only enter vaults 3 times total, afterwards they will no longer spawn. They appear on 3-2 and 5-2 on preloop, while on loop they appear on 1-2, 3-2, 5-2 and 7-2. The Vault starts at 120 HP. At 80 HP left, the center will break and you can bait enemies towards it. Do NOT hit the vault with a heavy hitting weapon. A weapon like the super plasma cannon can easily break this. You may have to bait enemies closer to the statue in order to bait them in. Plutonium hunger may help with this process. Horrors rad beam can help fill it up faster. When opening the portal, be sure that every other enemy in the level is dead, or else they won't count towards your kill count. Sometimes the portal can block your way, making the other side of the level inaccessible. There are not any in weekly runs, so don't bother looking. You will want to visit the vault as soon as possible. You will either be visiting it on 3-2, 5-2 and L1 1-2, or if you visit jungle, you'll miss the 5-2 vault and have to visit L1 3-2 instead. As for crowns, take Crown of Curses on 3-2 vault, as it will give you the best chances of getting to the cursed crystal cave. At the 5-2 vault, you can 'purify' your weapon, and pick a new crown. Feel free to pick up curses again. Haste is also pretty decent, but it doesn't really matter what you take here, just be sure to go here if not jungle to get that extra difficulty level earlier rather than later. The Loop 1 1-2 vault however is what's truly vital. Missing the other vaults isn't a big deal, however, taking crown of blood as soon as possible will get you the best possible kill count, so take this vault the most seriously. Also, don't worry about the less rads, as it's inconsequential and you'll be getting a lot more rads overall because of how densely populated levels become with it. The Cursed Crystal Caves is reached through having a cursed weapon on hand. This is one of the most dangerous areas of the game, as cursed laser crystals can "telefrag" you, instantly killing you with random teleporting, as well as a chance for the entire cave to be webbed. A little bit of luck and lots of carefulness and wall-hugging makes the CCC less of a threat, however. Having any crown makes cursed chests appear 14% of the time over normal chests. Crown of Curses make this 66% however, meaning you will want to take CoC on 3-2 vault as much as possible on daily runs. There aren't many tips when it comes to the CCC besides carefulness(hiding behind walls and such), however in order to get there a bit more often on loop, you will usually be carrying an ultra shovel and a super plasma cannon. Unless you are steroids, these weapons cannot drop again while holding them, so do not open a cursed chest until after the portal opens. Pick up two different weapons, and only then open the cursed chest, and you may be lucky enough to find a cursed ushov or spc! This area still isn't suggested if you have weak weapons or are in loop things can go wrong easily, but mastering it will pay off in the long run with that constant padded kill count. This part will be formatted differently into three parts, as it is the most important. This area is not recommended for people who are visiting Loop 1 for their first time. Part 1: What is it, and why is it powerful. And finally, it's time for the most stupidest, most bs, yet fun and rewarding part of the game: The I.D.P.D. headquarters. This area is reached through entering a van, and frankly puts everything else in this guide discussed so far to shame. HQ abuse is the best guarenteed extra kills, and is always recommended if you're able to handle the troubles it gives you. HQ is reached through entering a van in loop. Walking over the van right after it stops and clicking E will let you enter it. Then you can go through HQ1, HQ2, and HQ3, where HQ3 ends the game. However, you can exit through a van again in HQ1 or HQ2 and return to the wastelands. The reason HQ is so powerful is because you can redo 3 levels, that being 1-3, 3-3 and 5-3, the boss levels. 1-3 is the obvious victor and will always give you the most kills, so in either Loop 1 or Loop 2 you should be entering the van, go through HQ1 and possibly HQ2, then exiting via van and redo the entirety of 1-3, which can easily give you hundreds and hundreds of extra kills, all in one risky move. You may only enter HQ once. If you try to enter again, the van will blow up on you instead. Part 2: Which loop to take? So, the question is, do you want to do Loop 1 or Loop 2? In L1, there is only one cop car, and elites have a 20% chance to spawn over normal idpd. In L2, there is two cop cars that can give you a 2nd chance, and elites have a 40% to spawn over normal idpd. Loop 2 will easily give you an extra 200 or so kills(the number will widely vary, honestly. ), but will be much more dangerous. When it comes to recommendations, it's up to preference; if you're starting to do HQ, definitely do Loop 1. Loop 2 is easily more dangerous with how many elite cops you may run into, you may be relying on an utlra weapon by then which may make you tight on rads, and you won't be able to reap the extra kills if you're dead. I often go Loop 1 on dailies where I have bad sets, as I may not expect to even see Loop 2. However, with the perfect loadout, Loop 2 just gives a perfect amount of extra kills that can't be matched. Finally, do you want to return on HQ1 or HQ2? If you return on HQ1, you will deal with less elite cops, and if you miss the van you can always go to HQ2. However, if you go to HQ2, and miss it, you'll have to fight captain and your run ends there. I personally go HQ2 for the 2 extra dozen kills and extra difficulty, but in general it may not be worth risking your run, especially if you're new to HQ abuse. Part 3: Surviving HQ tips. HQ almost always has the same layout(L1 and L2 differ), so it's important to remember how the level is usually oriented. Egrunts will blow up your cover, einspectors will black hole you in, and eshielders will take you by surprise. The background also makes it more difficult to see their white and blue bullets. You will want to try and take out elite officers as fast as possible, without risking your life too much, as any of the 3 can mess up your chances to getting out of HQ with their high DPS. I usually try to "camp" the elite idpd out. Making sure one part of the map has no einspectors, you can wait until egrunts and eshielders get close enough, then go all out on them. After that, clean up any extra cops around, and once the van spawns in you should have a nice, safe area to return to 1-3 with. The only other thing is, pause your damn music for a minute. The cop cars give sound cues, and the elite idpd all make their own sounds. Plus, the HQ music is pretty damn good. Sound cues are a big part of the game, and where you have less room for error you need to use as many things to your advantage as you can. There are a few useful character tips as well, as follows. Plant: Snare makes the cop car stationary, making it easier to get in/out of HQ. Plant: Snare also can slow down egrunts, and majorly slow einspectors from walking towards you, giving you more clear shots and more reaction time. Horror: If you have anomaly really, just don't bother. It's possible, but getting stuck in HQ because you killed too many enemies is pretty awful. Eyes: Monster style can ♥♥♥ you over too, so be prepared to adjust for that. Strong Spirit will give you a few frames of invincibility, as long as you get into the van that's what's important, even if you take contact damage from the van and lose it. Don't play too stupidly, though. Rebel: Allies shoot no matter what, even into shielders and eshielders, so beware high amounts of deflected bullets. Never take Oasis if you want to score well. Jungle will get you more kills on preloop. On loop, it will give you around the same. Freaks from Mutant Tubes counts as kills, so break those. Revived corpses do not count as kills, as they've already been killed. Similarly, enemies spawned by other enemies don't count(from mom, hyper crystal, technomancer). Green Rats however do counts as kills. Vans count as kills as well. Guardians from the throne room count as kills. After the throne gives it's low health sound, you can start heading towards the bottom in order to awaken them all. Open all the idpd ammo chests you find. As YV, going to his crib after completing 1-2 L1, will let you do the level again. Rogue with the heat on her tail grants her extra kills. Don't enter the next level until the post-portal idpd are killed each level. YV's mansion doesn't really matter in terms of kills, but is nice to take if just to spice up a run. A note on normal runs: This guide is mainly focused on what you would do on dailies, in regards to your crown path. With a normal run, you'd want to start with crown of blood. A note on weeklies: You are locked to the crown you start with, and there are no portal vaults. Since you can try multiple times, this is a great way to try HQ abuse, which will help especially well since the leaderboards will be more concentrated in the Loop 1 and Loop 2 area.